A Letter from Fr. Roman taken from the OCtober 21, 2012 edition of We the People of God. Last month, I told you about a group of young men who have come to live at Sweetest Heart rectory for the purpose of discerning God’s calling. To our advantage, they bring with them the special training and skills of former seminarians. Since the old liturgy was the focus of the priestly formation they had received from their former community, I have asked these men to assist me by overseeing some aspects of the administration and Christian mission of the Tridentine community at St. Josaphat’s. If you are already involved in the activities that follow, or would like to become involved, please take the time to introduce yourself to the men and give them your contact information. Sign-up sheets may be found at the back of St. Josaphat’s Church. Michael spent six years with the Priestly Fraternity of Saint Peter (FSSP) completing everything up to the point of making perpetual promises. He has received first clerical Tonsure and the four minor ordinations of Porter, Lector, Exorcist and Acolyte. While with the Fraternity, his assignments spanned from inner-city Sacramento to rural Kansas, from Washington State to Normandy, France. His final assignment was in Detroit, the place of his birth, on loan to the Archdiocese as an aid to Bishop Reiss and as an assistant to the Chancellor. Michael is a certified catechist with over a decade of teaching experience. 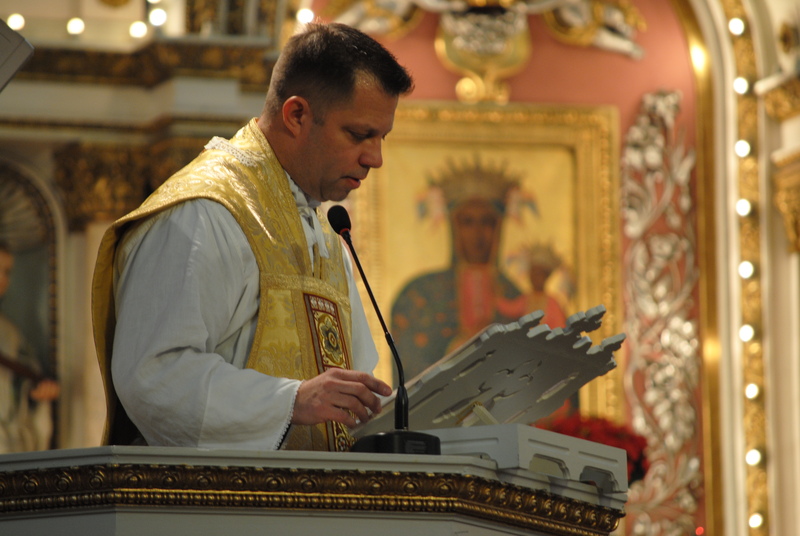 I have asked him to offer a Confirmation class for children who wish to be confirmed in the extraordinary form at St. Josaphat’s this coming Spring, and eventually to develop a catechism program for the young families of the Tridentine community. I am also placing Michael in charge of all server training relating to the Tridentine liturgy. Michael Travis completed the novitiate and one year of philosophical studies with the Fraternity in addition to a year spent at the Pontifical College Josephinum. He has received first clerical Tonsure. Though not from Detroit, Travis has lived in the inner-city most of his adult life. He has been a member of the Legion of Mary for several years and has extensive experience going door-to-door in urban neighborhoods of a similar demographic to our own. I have asked Travis to establish a Legion of Mary praesidium for St. Josaphat’s that will direct a vigorous and systematic evangelical outreach to the homes in the immediate vicinity. He will be responsible for training door-to -door missionaries according to the guidelines of Legion of Mary. If you might be interested in helping with our missionary effort, either going door-to-door or by supporting the missionaries with special prayers for success, please see Travis. Please keep Fr. Roman and these men in your prayers.